The gold sector is incredibly unloved and unwanted, whereas the tech companies continue to be in favor. 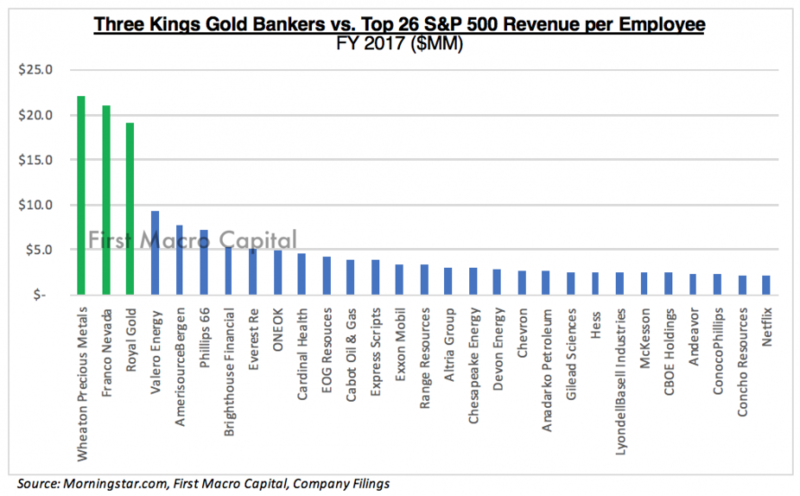 Over the next 2-3 years, we would expect the gap to widen on the two metrics, between the Three Gold Kings and the FAANG’s because of rotation out of tech and into materials. 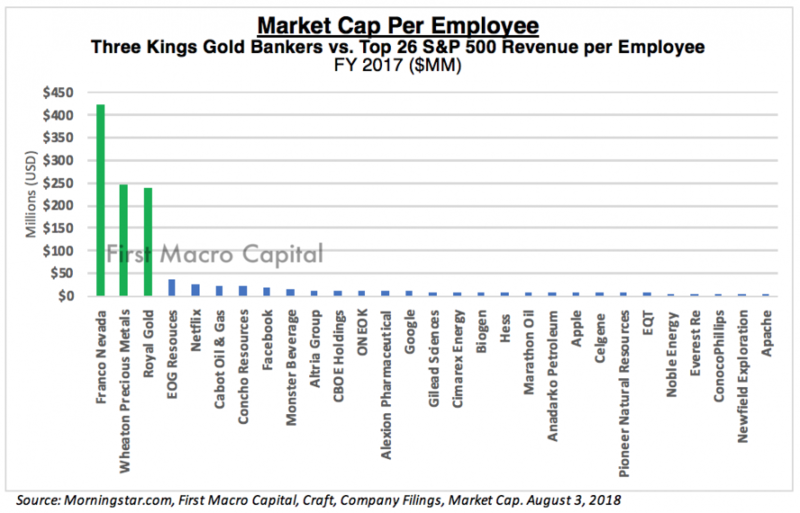 Market capitalization per employee will accelerate for the Three Gold Kings as capital flows increase to them because they tend to be in most of the gold ETFs, have liquidity, pay dividends, have reduced exposure to any one particular mine, and have a proven track record of creating shareholder wealth. 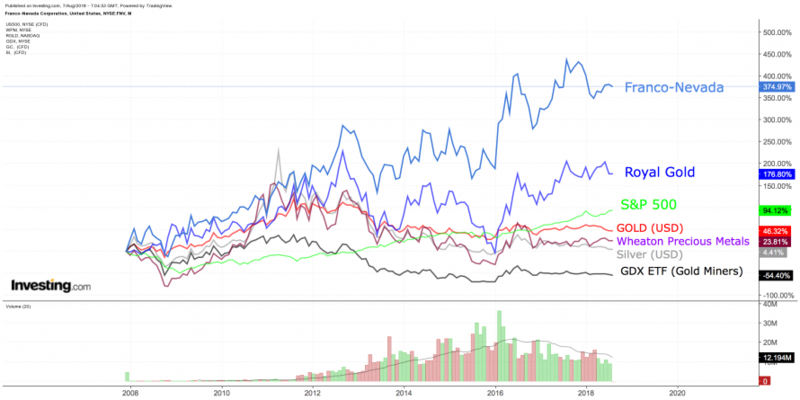 On the revenue side, the Three Gold Kings are growing the attributable gold ounces, each year over the next few years, that will further push them ahead of the FAANG’s. The Three Kings are doing this without having to add any new employees. Why the Royalty and Streaming Model works for the Three Kings? Wall Street and Bay Street (Canada) bankers flee the mining sector when the commodities sector is plummeting because risk and compliance assume the sector is riskier when the price is down. Which is completely illogical and irrational. This allows the Three Gold Kings to deploy capital when capital markets and traditional bank lending seizes up. Allowing them to get preferential terms because they are the banker of last resort. This is even more important when the larger miners need capital because there are fewer options to go for capital needs, particularly during challenging times. The royalty and streaming companies know the miners need capital because the banks and investors have fled. • "Production" growth tends to continue to grow year in and year out because as each new royalty and/or stream comes online, it adds to the existing streams and royalty.